N20 Series Strip provides an extra non-slip surface supplementing the step’s own non-slip properties as well as providing step edge contrast. The Ecoglo® N20 Series is a 1.5 inch (37.3mm) wide silicon carbide coated aluminum strip. ASTM E2073-02, Standard Test Method for Photopic Luminance of Photoluminescent (Phosphorescent) Markings. DIN 67510 Part 1, Phosphorescent Pigments and Products: Measurement and identification by the manufacturer. ISO 17398:2004 Clause 7.11, Safety Colours and Safety Signs- Classification, Performance and Durability of Safety Signs. 2. High durability indoors and outdoors. ASTM G155-04 Cycle 1 2000hrs, Standard Practice for Operating Xenon Arc Light Apparatus for Exposure of Nonmetallic Materials. Salt Spray Resistance: ASTM B117-97 500hrs, Standard Practice for Operating Salt Spray (Fog) Apparatus. Freeze-Thaw Resistance: ASTM C1026-87(1996), Standard Test Method for Measuring the Resistance of Ceramic Tile to Freeze-Thaw Cycling. 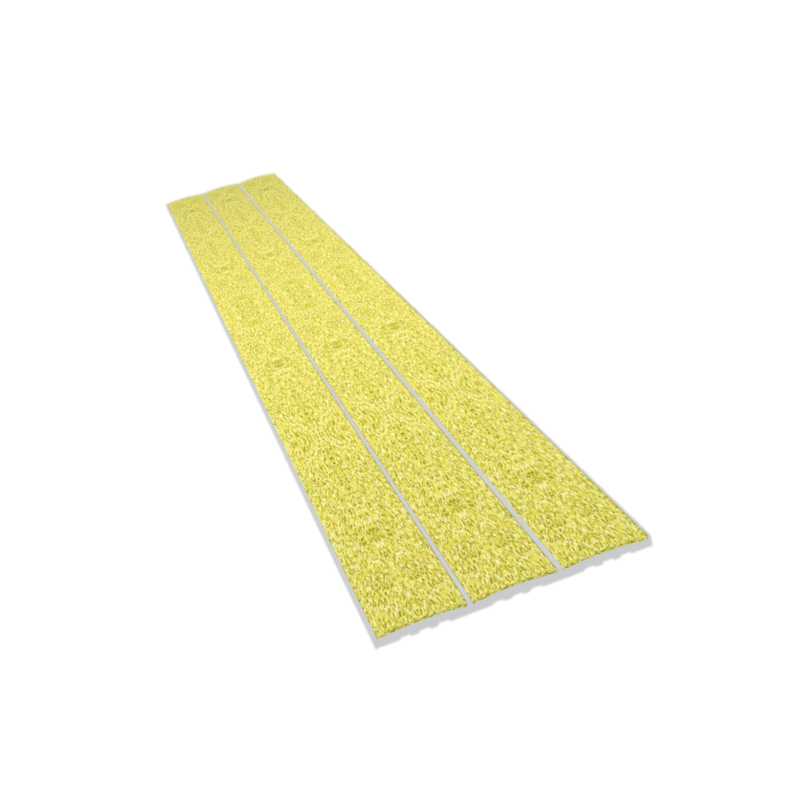 UL410, Standard for Slip Resistance for Floor Surface Materials. AS/NZS 4586-1999, Slip Resistance Classification of New Pedestrian Surface Materials. ASTM D1242-95a, Standard Test Methods for Resistance of Plastic Materials to Abrasion. ASTM F510-93(2004), Standard Test Method for Resistance to Abrasion of Resilient Floor Coverings Using an Abrader with a Grit Feed Method. JIS H8682-1:1999, Test methods for abrasion resistance of anodic oxide coatings on aluminium and aluminium alloys- Wheel wear test. ASTM D4828-94(2003), Standard Test Methods for Practical Washability of Organic Coatings. ASTM D3648-2004, Standard Practices for the Measurement of Radioactivity. Toxicity: Bombardier SMP 800-C (2000), Toxic Gas Generation Test. ASTM E162-02, Standard Test Method for Surface Flammability of Materials Using a Radiant Heat Energy Source. ASTM D635-03, Standard Test Method for Rate of Burning and/or Extent and Time of Burning of Plastics in a Horizontal Position. FAA AC 23.2 Paragraph 4.b, Horizontal Burn Test. Products are Aluminum based and 100% recyclable. Products are Aluminum based and approximately 20% of the aluminum content in an Ecoglo® secondary billet specification is recycled scrap. Ecoglo®’s Recommended Installation Adhesive has low VOC’s and qualifies for Indoor Environmental Quality credits for low emitting materials: EQc4.1.